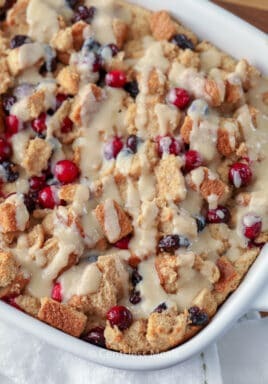 Follow Centsless Meals on Pinterest for more great tips, ideas and recipes! 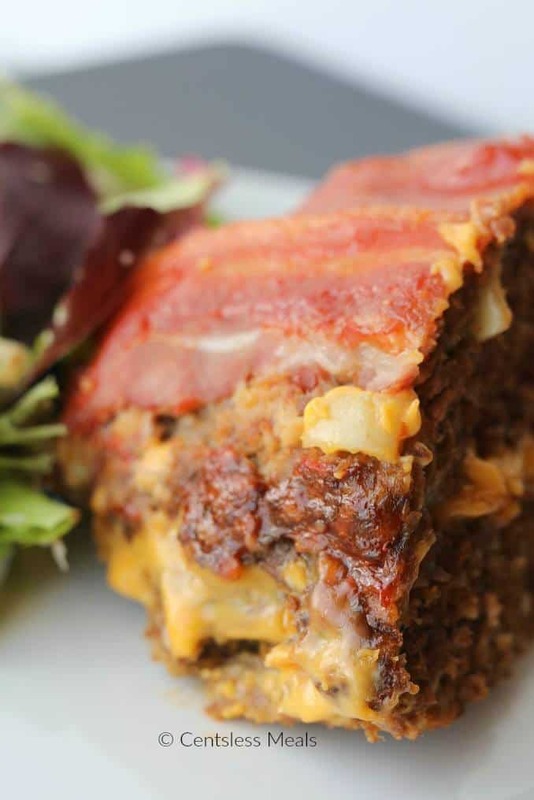 Such a fun twist on one of our favorite foods – cheeseburgers! This dish can be served with a side salad, Garlic Mashed Potatoes, your favorite pasta like Baked Macaroni and Cheese or even just a slice of bread. 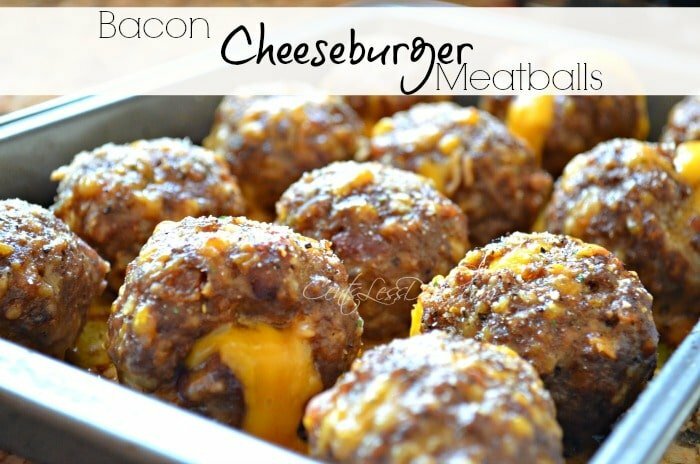 The combinations for complete meal ideas are endless when you begin with such a versatile main course like Bacon Cheeseburger Meatballs! as a fun and exciting change to everyday meal time. 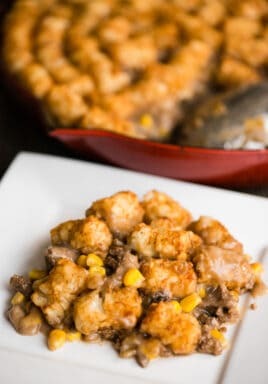 as a quick, easy to prepare and transport potluck dish. 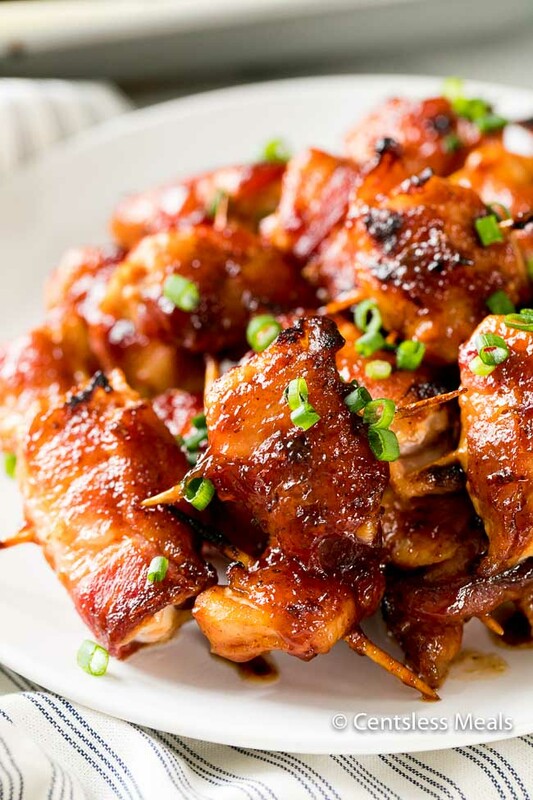 as a hearty appetizer for your next party. to keep on hand as a satisfying and filling after school snack or school lunch. This recipe calls for cheddar cheese, however use whatever your favorite cheese may be! Mozzarella or a spicy jalapeno monterey jack cheese would be equally delicious! Use what you crave or what you have on hand and you won’t go wrong! I love the addition of fried onions in this recipe but if you do not happen to have them on hand, you can simply use onion soup mix as a replacement. If you have fussy eaters who are not onion fans, just omit the fried onion and use 1 tsp. onion powder in the meat mixture for flavour. Both are great substitutions which work well. 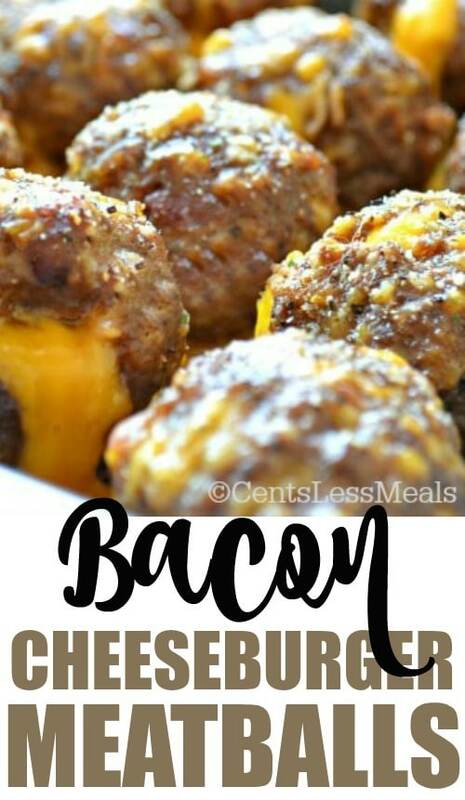 Bacon Cheeseburger Meatballs are a simple, super scrumptious recipe that taste just like a cheeseburger – minus the bun! In a large bowl combine egg, ground beef, flour, milk, bacon crumbles and crushed french fried onions. Shape meat mixture into a ball shape. 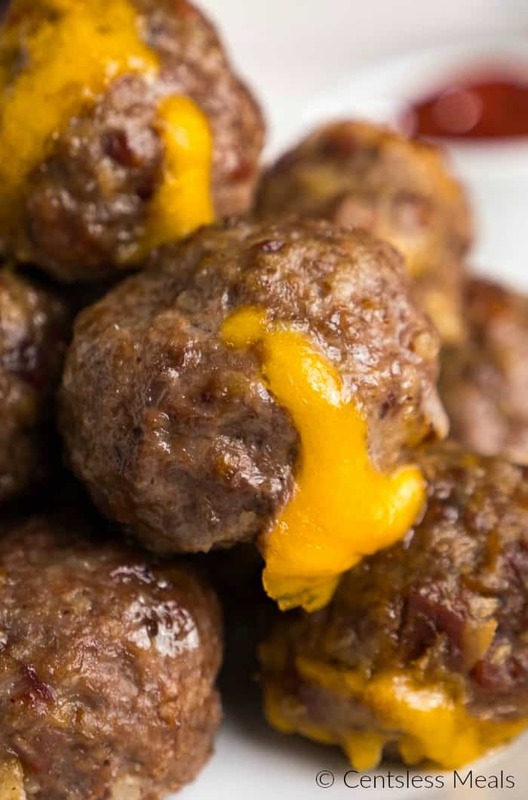 Stuff a cube of cheese into each meatball and cover with remaining meat mixture. Place meatballs onto a foil lined baking pan or cookie sheet. Bake at 375 degrees for 20-25 minutes or until cooked through. 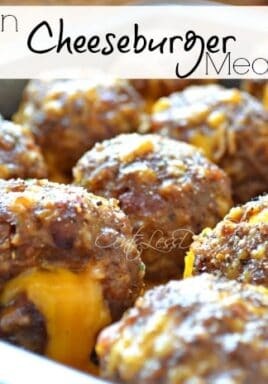 Bacon Cheeseburger Meatballs are a fantastic addition to your menu plan! So versatile, delicious and easy it will definitely become one of those recipes that you turn to again and again! 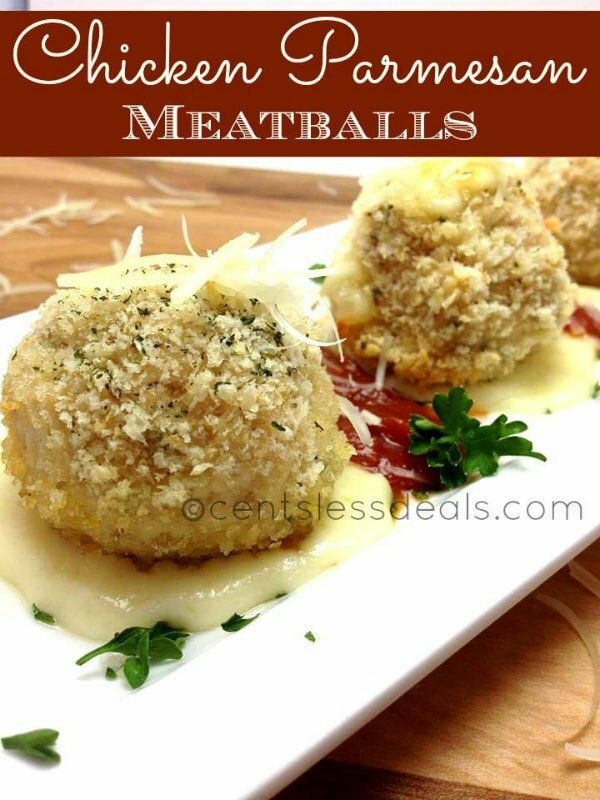 May I ask if the 440 Calories is just 1 meatball? Hi Troy, 440 calories is for approximately 4 meatballs. I like to mix the shredded cheese into the meatballs, and wrap them around apiece of pickle. Tonight I am adding diced banana peppers. Yummy! That sounds really good Lynette!! 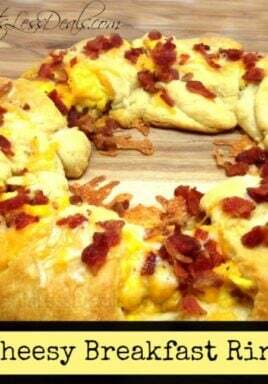 I will be making these for the FSU-ALA game Saturday! That should be “cheddar”, not “cheedar”. I wonder if you could mix in shredded cheddar instead of stuffing the cubes, like I do for our sausage balls at the holidays, which uses Bisquick mix and ground sausage? I have these in the oven now! Making the house smell AMAZING! AM-I got 15 meatballs out of this recipe!! This looks yummy! Can you please let me know how many meat balls you get out from this recipe?